EUR 1,29 incl. tax special price! The "grill cube" transforms itself after lighting in just 10 minutes without any further action into a perfect bed of embers - in any weather, at any event, anywhere. "Rage instead glow"? Those days are gone! The Grillcube has already built-in what professional barbecue's otherwise have to manually construct: a central chimney, which accelerates the burning process. Traditional charcoal barbecue on the fine art - anytime, anywhere. Always perfect embers, only accessories needed: 1 match. Ready to use in all weather conditions, even in snow and ice and wind. Compact, lightweight, ideal for travel (vacations, mountain hut, camping). A true time saver, ready to grill in 10 minutes. Aromatic, long burning alder charcoal*. 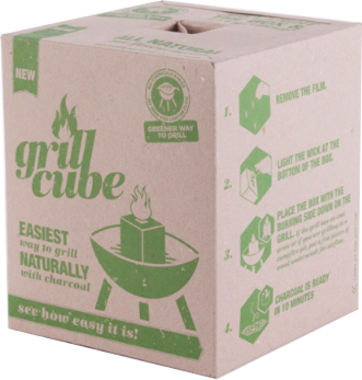 Allows perfect hospitality at barbecues by using several parallels barbecue cubes. Content: 900 g alder charcoal. * Due to the high carbon content of coal is made ​​of alder wood flammable and the fire developed a uniform temperature over the entire focal length. Ideal for BBQ success. Alder wood gives the food to be smoked a red-brown color and a heavy smoke flavor. Even the ancient fisherman said, "the fish comes out of the water, which also alder comes, the fish only alder smoke." ** In Germany alone each summer sparked millions grill fire. But the dangers are often overlooked reprehensible. Up to 3000 BBQ accidents with some doctors treat severe burns each year. Often accelerant in the game, a recent study. Scores of people have accidents every year due to improper operation grill. Source: Webnews.